Speed51.com will be on hand at Oxford to give you the complete rundown of what goes on in the Triple 50s. 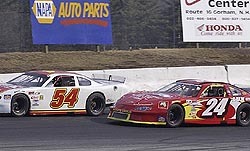 Speed51.com will also make the trip to Thompson Speedway on Sunday for a rare NASCAR Touring double feature. The NASCAR Busch North Series will start their season [after the scheduled season opener at Lee was rained out three times] on Sunday along with the NASCAR Whelen Modified Tour. Both divisions will contest 100 lap feature races at Thompson. 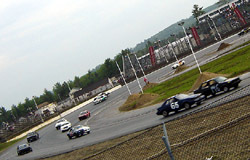 Meanwhile, the ACT Late Models will take to the White Mountain Motorsports Park (NH) to continue their season. Cris Michaud is the ACT point leader, but expect a tough challenge for the victory from hometrack hero David Avery. In the past few seasons, a summer trend has emerged at racetracks throughout New England to promote mid-week shows with entry level divisions and low ticket prices. No place has seen this work out better than in Maine, where car counts at several area tracks for these events are in the triple digits for these events. “The PASS Super Late Model/Pro Stocks will follow the same qualifying procedure as they do in all 150 lap race – time trials, followed by heats and consi(s), then the dash for the top ten in time to set the field for the first segment. Thereafter, it all takes a turn for excitement and adventure because the field will be inverted after the first and second 50–lap segments. There will be racing in high places this weekend in parts of New England on Saturday night. The True Value Modified Racing Series will descend on the Monadnock Speedway in the hills of southwestern New Hampshire for their third event of the season there. Kirk Alexander is gunning for four race victories in a row on the Tour this week as other drivers who have shown themselves capable of running of front this year, including Andy Seuss, Jim Boniface, Jimmy Kuhn, Peter Daniels and Louie Mechalides, are looking to break through into the win column. Speed51.com will have some fun with this concept in 2005. This writer will drive the #51 mini truck at Oxford in some of the Wednesday night shows there. The truck was not quite ready for opening day, but we’ll have further updates when it is ready for primetime. Part of the mid-week Unity show is a Modified division using the same basic rules as the PASS Modified division. Last week, PASS Pro Stock driver Travis Benjamin ran in the division, but ended up on his head in his heat race. His car had a bent spindle, bent header and multiple other problems, but the team went to work and got it ready for the feature. Now, as a sign of summer being in full swing, the tracks have gotten their mid-week shows underway. Unity got their Thursday Night racing card going last week and Oxford competitors got going this week after a one hour rain delay. Beech Ridge Motor Speedway kicks off their Thursday Night Thunder show this week. Most of the tracks stick to a simple formula of divisions – a full-sized hobby stock-type division,with Monte Carlos seeming to be the car of choice, a four cylinder division with plenty of Hondas and VWs and a min-truck division with S-10s and Rangers. Benjamin’s car wasn’t just able to run the feature. It was able to lead laps and finish second. 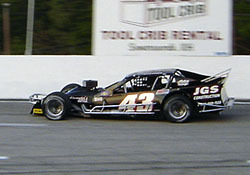 Chad Dow ended up winning the feature, but Benjamin held on for a second-place finish. This week’s IBG-Pro Stock race has something a little bit different in store. Instead of being a straight 150 lapper, the event will be split up into three 50-lap segments. This writer isn’t particularly great with math, so here is what the latest PASS press release has to say about the format. Maine native Drew Sprague is getting some help from friends in high places with his USAC Ford Focus Midget Series racing program. Sprague will run his car for his father Jeff’s Fast Forward Racing Team in association with the legendary Seymour Enterprises operation with sponsorship from Briggs and Stratton. The partnership of Drew and the Seymours has been in play for over a year and included an inaugural outing in USAC Ford Focus Midget competition in the Fall of 2004 in Anderson, South Carolina. Sprague qualified second for that race but had troubles in the feature. Still, an instant bond formed. Louie Mechalides has been busy lately with his entry in the True Value Modified Racing Series lately, but he also loves Pro Stock racing. 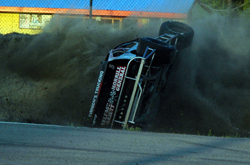 However, after a wreck wiped out his #47 in the PASS feature at Thompson last month, he hasn’t been doing much of that in the past few weeks. Mechalides does have a ride lined up for next week’s Unity 250 Pro Stock race in Maine however. In typical racer fashion, Louie doesn’t remember much about the appearance of his Pro Stock ride, but he can tell you exactly how well it goes.